It’s Saturday! Are you making the most of it? If you’re looking for a series to get lost in, then give the Five Oaks Ranch series a chance. It’s my bestselling romance series about the Cauthen family. Each book is about a different sibling, but all of the family are entwined in all the books. Get all 6 books for only $9.99! Categories: Uncategorized | Tags: #Cowboyromance, #Family, #FiveOaksRanch, #writerslife, Book Deals, Boxedset, Romance | Permalink. Are you ready for the new year? Think about it this way; It’s a new year, so why not make this the year you’ll make a change. Maybe it’s stop doing something considered a habit. Maybe it’s stepping up the game with your career. Maybe it’s just getting healthy. But whatever it is, do it to the best of your ability and do it for yourself. Categories: Uncategorized | Tags: #amwriting, #NewYear, #writerslife | Permalink. Send out the old; Happy New Year’s Eve! I’ve already got my writing schedule completed for 2019 and my preorders ready to schedule. This new year will be my year of change as far as my writing goes. I’m more organized and I plan to push further in my writing career. 2018 has been an amazing year for my writing and I hope the trend continues for the new year. So, what are your promises for the new year? As always, good writing and May God Bless You in the new year! Categories: Uncategorized | Tags: #amwriting, #writerslife, New Year's Resolutions, Resolutions, Writing | Permalink. My writing life started when I was a young teenager and I picked up the romance novel that made my fingers itch to put words on paper. 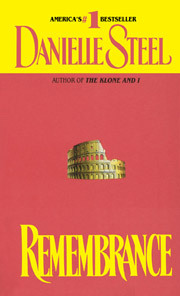 And that novel was Remembrance by Danielle Steel. After reading it, I began to devour her books, one by one. This also started my obsession with reading romance and writing it. I still have my collection of her books and the Harlequin books that I’ve gotten over the years. It’s amazing what an impact that a book can have on you. I’m so glad that I picked up that book in the second hand store. I just wish I’d thought about publishing my work a long time ago, but maybe it wasn’t time yet. So, what inspired you to start writing? If you’d like to tell your story on my blog, just let me know. P.S. : If you’ve never read one of Danielle Steel’s books, then I suggest you start with this one. Categories: Uncategorized | Tags: #amwriting, #writerslife, Danielle Steel, Inspiration, Remembrance, Romance, Writers | Permalink. So, what is your day like? Recently I had the pleasure of doing an interview with Southern Writer’s Magazine, which will come out soon. It was eye-opening as I wrote out my answers to the interview questions. I realized that every day I manage somehow to schedule in some stress-relieving words. You may be saying, didn’t you already know that? Some days I think I don’t get enough time to write, but then others I get more than enough. Yesterday I caught myself daydreaming about a character that has filled my head lately. Before I knew what I was doing, I was filling up stick it notes with character traits. Thank goodness I was waiting on a file to download, or I would’ve gotten behind. Then, the rest of the day, my eyes would go to those notes, wanting to write the story. Well, hopefully, today I’ll get to put a little work in on it. Life steps in, but writing is part of that life, so make some time to focus on your dreams. This life is short, so make the most of it. Don’t forget to get up and walk some, it’s good for you and many writers don’t realize this. But that’s for another post. Categories: Uncategorized | Tags: #amreading, #amwriting, #writerslife, Authors, characters, Leisure Time, Life, time, work | Permalink. It’s Saturday and time to take a moment to just sip my coffee, check my stats and just be… Of course I have plenty to do, but it might take another cup of coffee to get me up and going. So what’s up with you this beautiful morning? So, as I amble through my social media, it reminds me that I need to set up my automatic ads for the week, write a couple thousand words today, clean house and do laundry. But, well… Yep, I think another cup of coffee is waiting for me. Then maybe I’ll get started on my list. Be lazy for a moment and just be… It’s good for the soul. Don’t forget the coffee or tea, whichever is your go to! HAPPY SATURDAY! Categories: Uncategorized | Tags: #amwriting, #Saturdaythoughts, #writerslife, Authors, coffee, Laundry, lazy, Romance, Saturday, Writing | Permalink. Power writing? That’s what I call the writing I do when I try to get as many words into the manuscript as possible. Usually on the weekend is when I do my best power writing. It’s quiet and there’s no deadline for the day, just writing time. So, I power write. I’ve changed up my writing this year. With the current manuscript, I’m upping the word count. Normally, I’m known for the mid 30’s in word count, but this one, well, it’s going to the mid 60’s. If you’re a writer, and you’re used to writing a certain length, when you change that up, it changes the game. I feel as though I’ve gone into another realm. It’s exciting. So, get a nap, take a walk, and write. Categories: Uncategorized | Tags: #writerslife, Power Writing, Ramblings, Sunday naps, Sunday's, Word Count | Permalink.